Add a touch of class to any celebration with premium wine, high-quality champagne, and world-renowned port. Our Wine Gifts are guaranteed to be filled with bottles of the finest potent potables from all over the world. Whether your recipient enjoys an occasional toast or they're a bona fide connoisseur, you're sure to titillate their taste buds when you send our Wine Hampers. Whether your recipient is out of state or overseas, we make it simple to deliver their favorite drink in a just a few days. 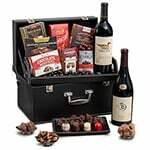 Wine Gift Baskets are an ideal addition to holiday feasts, birthday parties, business celebrations, and romantic occasions. Send Wine Gift Sets to the people you love, treasured friends, corporate VIPs, and even your special someone anywhere in over 180 countries. To send a Wine Gift (almost) anywhere in the world, simply choose the country and select a wine gift. You can fill out delivery information in our easy-to-use online order form. Share the spirits! Send a Wine Gift Basket to someone important in your life today. Please note: Wine Baskets are not available in selected countries & territories where alcohol delivery is prohibited by law. Please see our Delivery Locations Page to review delivery restrictions in country of your interest.